A paper published today in Non-Linear Processes in Geophysics, co-authored by CAGW skeptic and Professor of Geophysics Dr. Vincent Courtillot, finds a "change in regime of solar activity" during the 20th century correlated to the quasi-biennial oscillation (QBO), a wind reversal that "dominates" variability of the lower stratosphere and in turn "affects a variety of extratropical phenomena including the strength and stability of the winter polar vortex." Solar modulation of the quasi-biennial oscillation (QBO) has also been found by several other papers, and may represent one of several proposed solar amplification mechanisms modulating climate change. We propose that the HSV [half-solar-cycle] behavior of the irregularity index of ISSN [International Sunspot Number] may be linked to the presence of strong QBO [quasi-biennial oscillation] before 1915–1930, a transition and their disappearance around 1975, corresponding to a change in regime of solar activity. Although the mechanism is not understood, the authors find good correlation between their "irregularity index of ISSN [International Sunspot Number]" and the strength of quasi-biennial oscillations, which "dominates variability of the lower stratosphere" and which may in turn control the jet stream and winter polar vortex that led to this winter's record US cold temperatures. Red curve is the solar geomagnetic aa index, blue line is the author's new 'Irregularity index of the International Sunspot Number'. The authors propose the highly variable irregularity index in the first part of the 20th century led to strong QBOs [quasi-biennial oscillations] "before 1915–1930, a transition and their disappearance around 1975 corresponding to a change in regime of solar activity." Note also the strong increase in geomagnetic activity during the first half of the 20th century and sustained high levels thereafter to 2000. Can irregularities of solar proxies help understand quasi-biennial solar variations? Abstract. We define, calculate and analyze irregularity indices λISSN of daily series of the International Sunspot Number ISSN as a function of increasing smoothing from N = 162 to 648 days. 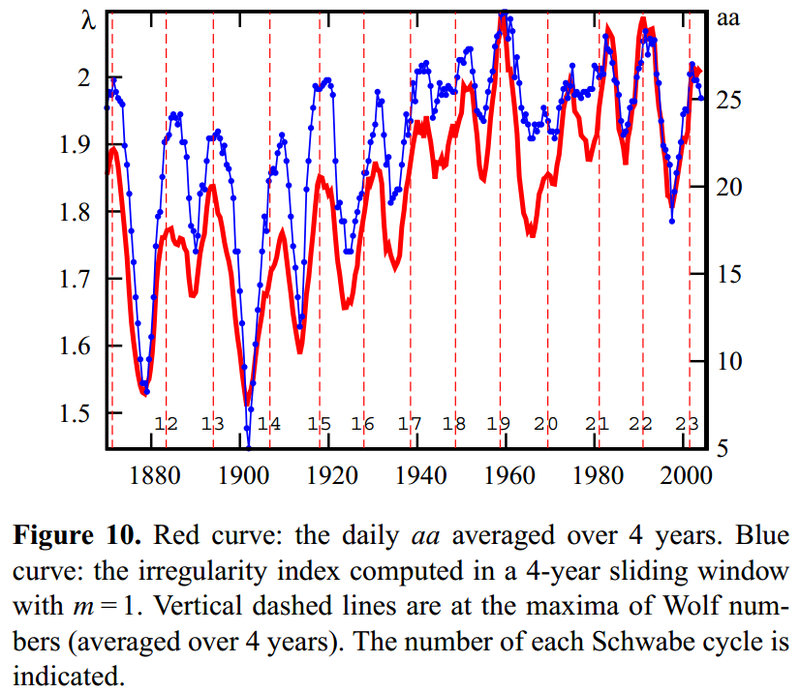 The irregularity indices λ are computed within 4-year sliding windows, with embedding dimensions m = 1 and 2. λISSN displays Schwabe cycles with ~5.5-year variations ("half Schwabe variations" HSV [half a solar cycle]). The mean of λISSN undergoes a downward step and the amplitude of its variations strongly decreases around 1930. We observe changes in the ratio R of the mean amplitude of λ peaks at solar cycle minima with respect to peaks at solar maxima as a function of date, embedding dimension and, importantly, smoothing parameter N. We identify two distinct regimes, called Q1 and Q2, defined mainly by the evolution of R as a function of N: Q1, with increasing HSV behavior and R value as N is increased, occurs before 1915–1930; and Q2, with decreasing HSV behavior and R value as N is increased, occurs after ~1975. We attempt to account for these observations with an autoregressive (order 1) model with Poissonian noise and a mean modulated by two sine waves of periods T1 and T2 (T1 = 11 years, and intermediate T2 is tuned to mimic quasi-biennial oscillations QBO). The model can generate both Q1 and Q2 regimes. When m = 1, HSV appears in the absence of T2 variations. When m = 2, Q1 occurs when T2 variations are present, whereas Q2 occurs when T2 variations are suppressed. We propose that the HSV behavior of the irregularity index of ISSN may be linked to the presence of strong QBO before 1915–1930, a transition and their disappearance around 1975, corresponding to a change in regime of solar activity. "the strength of quasi-biennial oscillations, which "dominates variability of the lower stratosphere" and which may in turn control the jet stream and winter polar vortex that led to this winter's record US cold temperatures. " and it all went into reverse around 2000. What they need to realise though is that high solar activity reduces ozone in the stratosphere especially towards the poles and low solar activity does the opposite. I would advise to contact Piers Corbyn who predicts weather forecasts using solar activity, which the MET Office doesn't understand. Interesting but seems like a major effort to reproduce since it seems to rely on several other papers and does adequately describe the method used. It would be more impressive if they were not distorting and inverting the data with a crappy filter before doing the analysis. It seems odd that people that seem comfortable attacking some fairly complicated maths are not capable of finding decent filter and are , apparently, unaware of distortions caused by running averages. They repeatedly say they are "averaging" the data which is inaccurate since an average results in less data points. It is clear from the graphs that they are averaging the data. It is known that the noise level is highest at solar minima and it has been suggested by Ray Tomes that the data should be square rooted before analysis, without giving a justification ( econometrics mentality ). Taking the square root of SSN does give a more even noise level (high freq variability). This may have more to do with nature of observations where detectability is determined by the angular resolution of the observing optics. This translates to smallest _linear_ dimension of sunspot features on the photosphere, which is probably not a function of the underlying physical process, more properly related to the area. This will lead to a larger errors when studying smaller features at solar minima. fig B2 in the paper shows it is picking stronger 'irregularity' at cycles with low solar minima. It remains to be seen whether findings with arbitrarily selected parameters are not simply detecting the anomalous distortions produced by the running mean filter. If they repeat the exercise with proper filtering and get similar results it may be worth a closer look. Perhaps you should submit a comment on the paper to the journal or write to the authors. I'm sure they would be happy to discuss. BTW if you would like to write up your solar/climate model for a lay audience, I'd be happy to make a guest post.